We are living in a challenging investment environment. Locally, we have much uncertainty in the near future, while globally we have both low deposit rates and low government bond yields. Additionally, we have a global economic cycle that by historical standards is long in the tooth. As a result, no asset class looks set to be a clear winner going forward. Investing in this environment is very difficult and although investors have recognised this change, they have not necessarily modified their investment strategy. In this article we explore the returns investors have received in the past ten years, highlighting typical investor behaviour over this period and how this behaviour can destroy significant value. By chasing performance on asset classes, investors can forgo 55% when compared to an average balanced fund (over the ten-year period). For the last ten years, it mattered less in which asset class you invested your money, as they all provided a real return. 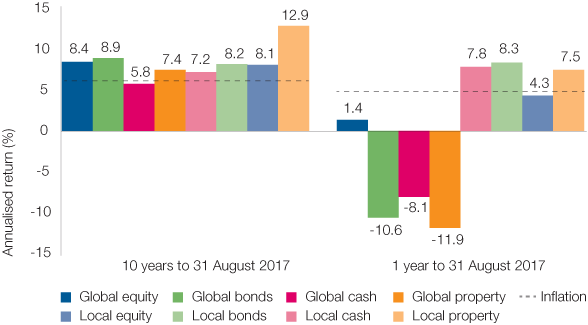 As can be seen in Figure 1, over an annualised ten-year period (ended 31 August 2017), every asset class outperformed inflation. However, over the last year (12 months to 31 August 2017), returns have struggled to beat inflation or cash for more than half the asset classes shown. This illustrates both how volatile short-term returns can be and how real returns have decreased in the recent past across the board. Source: Morningstar to 31.08.17. Past performance is not an indicator of future performance. ASISA sectors used as a proxy for asset classes. 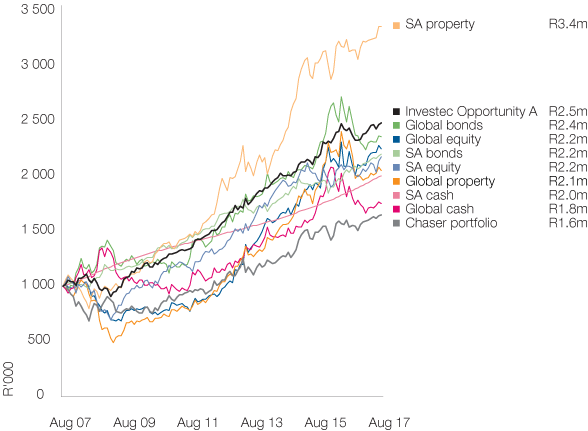 Furthermore, the South African equity market has largely moved sideways over the last three years, delivering returns less than cash. These returns came at the price of significant volatility, with a 22% range of returns during this period, as demonstrated in Figure 2. As a result of market volatility and the depressed return environment, we have seen increasing flows into money market funds over the last 18 months. Additionally, there is a significant amount of money sitting on the sidelines, with retail bank deposits increasing to over R1 trillion in June 2017, from R700 billion two years ago. Source: ASISA to June 2017. No asset class consistently outperforms every year and most asset classes have their turn at being the worst performing asset class in a year. Unfortunately, investors often chase performance, investing in asset classes, funds, strategies or managers based only on recent outperformance. This is partly evident in the move to cash and the money market that we have witnessed. However, this behaviour is often destructive and can lead to poor investment outcomes, which is more pronounced in volatile markets. Chasing last year’s winner is likely to destroy value over time. This is evident using the following simple example. Assume that an investor has a portfolio which invests in the best performing asset class of the previous year (called the “chaser portfolio”). Every year, for ten consecutive years, on 1 January, the investor switches into the best performing asset class of the previous year. We compare this strategy to the underlying asset classes as well as a balanced fund. As can be seen from Figure 4, the portfolio where the investor chases the best performing asset class from the previous year delivers the worst return. Even the worst performing asset class over the ten-year period outperformed the chaser portfolio by a cumulative 10% (or 0.7% p.a.). While this example is exaggerated, it highlights how destructive this behaviour can be. It is important to note, that the annual switch may also be subject to capital gains tax, reducing the after tax return. Investec Opportunity, a balanced strategy which makes use of all the underlying asset classes, delivered the second best performance over the ten-year period. This return is second only to SA property, which has had a stellar run over the last ten years. However, it is important to note that the performance of the Investec Opportunity strategy came at less than 60% of the risk of SA property, as measured by volatility. Source: Morningstar to 31.08.17. Past performance is not an indicator of future performance. ASISA sectors used as a proxy for asset classes and do not represent alternative investment choices in their own right. Figure 4 is for illustrative purposes only to demonstrate the impact of chasing past performers. The same exercise can also be done where the investor picks the best performing fund and switches into last year’s winner within the ASISA Multi Asset High Equity sector. We illustrate this in Figure 5, which assumes that an investor switches into the best performing fund from the previous year in January each year. For an investment of R1 million made on 1 July 2007, the difference between the chaser portfolio and an investment in Investec Opportunity would be nearly R900 000 today (a difference of 4.8% p.a. over ten years). Morningstar as at 31.08.17, NAV based, (net of fees, excluding initial charges). Highest and lowest 12-month rolling performance since inception is 43.8% and -15.7% respectively. Past performance is not an indicator of future performance. Figure 5 is for illustrative purposes only to demonstrate the impact of chasing past performers. The total expense ratio of the Investec Opportunity Fund is 1.84%. Some investors try a different approach and chase the worst performing fund from the previous year, with the expectation that this underperformance will turn around. This can also be value destructive as is evident when taking our last example one step further. A portfolio, whereby an investor switches into the worst performing Multi Asset High Equity fund from the previous year, would have returned R1.9 million, R600 000 less than just leaving their money in the Investec Opportunity Fund. All of these examples demonstrate that switching on the basis of past performance can be value destroying. Removing emotion from investment decisions is especially difficult when dealing with your own money. In these uncertain times, it’s best to seek professional advice from a financial advisor. All information provided is product related, and is not intended to address the circumstances of any particular individual or entity. We are not acting and do not purport to act in any way as an advisor or in a fiduciary capacity. No one should act upon such information without appropriate professional advice after a thorough examination of a particular situation. Collective investment scheme funds are generally medium to long-term investments and the manager, Investec Fund Managers SA (RF) (Pty) Ltd, gives no guarantee with respect to the capital or the return of the fund. Past performance is not necessarily a guide to future performance. Performance figures above are based on a lump sum investment, NAV-NAV, net of fees, gross income reinvested, in ZAR.The value of participatory interests (units) may go down as well as up. Funds are traded at ruling prices and can engage in borrowing, up to 10% of fund net asset value to bridge insufficient liquidity, and scrip lending. A schedule of charges, fees and advisor fees is available on request from the Manager which is registered under the Collective Investment Schemes Control Act. Additional advisor fees may be paid and if so, are subject to the relevant FAIS disclosure requirements. Performance shown is that of the fund and individual investor performance may differ as a result of initial fees, actual investment date, date of any subsequent reinvestment and any dividend withholding tax. There are different fee classes of units on the fund and the information presented is for the most expensive class. Fluctuations or movements in exchange rates may cause the value of underlying international investments to go up or down. Where the fund invests in the units of foreign collective investment schemes, these may levy additional charges which are included in the relevant Total Expense Ratio (TER). A higher TER does not necessarily imply a poor return, nor does a low TER imply a good return. The ratio does not include transaction costs. The current TER cannot be regarded as an indication of the future TERs. Additional information on the funds may be obtained, free of charge, at www.investecassetmanagement.com. The Manager, PO Box 1655, Cape Town, 8000, Tel: 0860 500 100. The scheme trustee is FirstRand Bank Limited, PO Box 7713, Johannesburg, 2000, Tel: (011) 282 1808. This is the copyright of Investec and its contents may not be re-used without Investec’s prior permission. Investec Asset Management (Pty) Ltd (“Investec”) is an authorised financial services provider and a member of the Association for Savings and Investment SA (ASISA). Issued by Investec Asset Management, October 2017.